Where to buy beans from? Do you want to cook moi-moi? Or thinking about beans cake (akara)? What about boiling beans with your Nshima dish? ...Or just want to cook beans to go with your rice (waakey), plantain, yam or gari? We stock various varieties of beans. Whatever you want beans for, get it here anytime and get it delivered to you any here in the world, all at the click of your mouse! We stock black eyed beans, red kidney beans, crab eye beans, butter beans, Nigerian sweet honey brown beans (ewa oloyin), red lentils, cow peas and even bean flour (cleaned and ground beans) to your culinary delight. Are you new to the use of beans? Why not go to our page on beans section to learn more about how to prepare this delicious African cuisine. You can also read more about beans’s nutritional value, and other related issues. 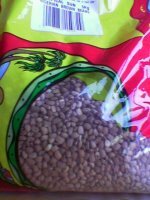 For more information on types of beans and beans recipe, and how to buy beans and cook it hassle free see the above section.